Sunday morning, we cleared out of Antigua - a complicated procedure involving four different queues for officials to stamp our papers and passports – and, to the strains of a steel band, left Nelson’s Dockyard. Thank you to Sarah, Regine, Jenn and all the Oyster team for such a splendid send-off! 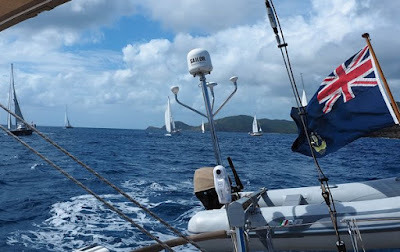 After a quick dip in Galleon’s Bay, we were ready at 1300 local time for the big start. It was an exhilarating sight as thirty Oysters surged across the line in 20 knots of wind and big waves. Soon, groups began to disperse and it became clear that five of us were heading for Guadeloupe. If boats are heading in the same direction, Charles assumes they are racing. So Aldeburgh Yacht Club, James and Hilary Grogono, Keith and Caroline Martin and Charles and I were trimming away, full sail in 20 knots of wind at 120T. Perfect trade wind sailing! We were gratified to pull ahead of Lisanne, the victor of 575s at Palma Regatta and overall winner of the ARC, but couldn’t quite beat Dalliance, an Oyster 62. 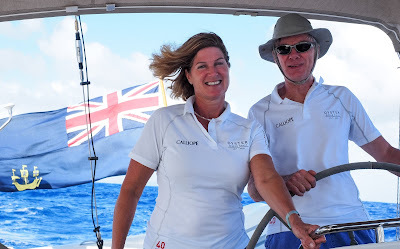 Nicky was delighted, when helming, to achieve 10.4 knots of boat speed, our previous Mediterranean record, but shortly afterwards, Keith got Calliope up to 11 knots, surfing down a wave. We arrived in Guadeloupe just after a spectacular sunset, in the very brief time before it gets pitch dark here. 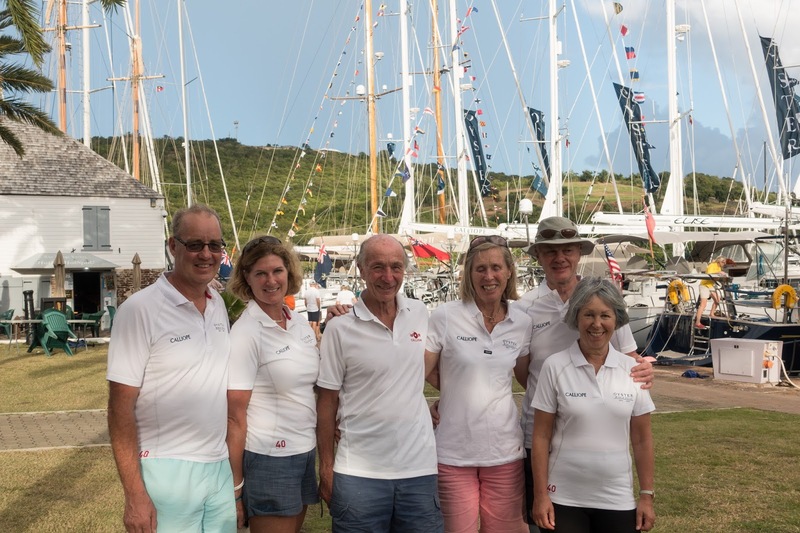 Was it the slightly rolly anchorage – much less bad than the one on Mallorca with David, Julie, Caroline and Jose in October? – no, I think it was the remains of adrenaline from the day which kept me awake all night. The rest of the crew slept soundly. Today we are heading for Les Saintes, a small group of islands off the South coast of Guadeloupe, via Pigeon Island, which lies in Jacques Cousteau’s marine reserve, where we hope to find good snorkelling.